President Emeritus Walter T. Cox (b. September 19, 1918 d. June 28, 2006) was a member of Clemson University's Class of 1939, and was the third alumnus to rise to the status of president (1985-1986). "Dean" Cox served Clemson in almost every role imaginable, from an offensive guard for the football team while a student, to the football team's line coach, from the baseball coach and ticket manager, to an assistant to the president and director of alumni affairs, from dean of students, to vice president for student affairs. Dean Cox devoted his life to Clemson, and even after his retirement was often seen around campus saying hello to fellow Tigers. Walter Thompson Cox was born September 19, 1918 in Belton, South Carolina, the son of Walter T. and Grace Campbell Cox. He entered Clemson College in the fall of 1935. He served as a company commander in the Cadet Corps, and was an all-state guard on the football team. He graduated with a degree in General Science in 1939. Returning in 1940 during a year of post graduate study, Cox anchored the offensive line while playing for the football team. The season was a success, as Clemson defeated Boston College 6-3 in the Cotton Bowl. It was the Tigers' first post-season appearance. "During his eight months as Clemson's tenth president, Walter Thompson Cox moved swiftly and decisively and with patient firmness of purpose to restore the confidence of the faculty, staff and student body, to boost the morale of alumni and friends, and to reestablish with the people and leaders of South Carolina Clemson's reputation for high standards and sound management." 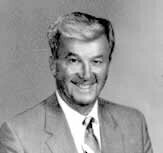 Cox officially retired in the spring of 1987, though he continued to be involved in development activities on behalf of Clemson University until his death in 2006. Dean Cox was dismounting Old Glory at the end of Flag Day on June 14 at his home on Folger Street, when he took a fall that put him in the hospital and began his final decline. Walter Cox passed away on June 28, 2006 in Greenville, and is dearly missed by the entire Clemson family. Cox was married to former Mary Johnson in 1940. Together they had four children: Walter T. III, Frank, Grace, and William. After Mary Johnson Cox's death in 1985, Walter Cox was remarried to the former Jenelle Garrett Cox in November of 1986. Cox Plaza is named for President Cox and was dedicated on November 20, 1998. A sculpture of Dean Cox sitting on a bench was created by T. J. Dixon and James Nelson. Walter T. Cox Boulevard, the portion of S.C. Route 93 that passes through the Clemson University campus, was named for him on June 17, 2002. Cox received the Clemson Alumni Association's Distinguished Service Award in 1965. Wunder, John R., "A Good Sport: Walter Thompson Cox, 1985-1986", McKale, Donald M., editor, "Tradition: A History of the Presidency of Clemson University", Mercer University Press, Macon, Georgia, 1988, ISBN 0-86554-296-1. This page was last modified on 29 December 2009, at 19:53.